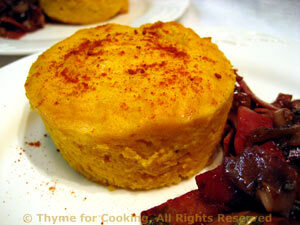 Pumpkin Timbale, Prosciutto, Shallots, Thyme for Cooking starter. Canned pumpkin, which is normally pure pumpkin with nothing added, is a delicious vegetable, suitable for much more than pies. Butter 2 ramekins and line bottom with buttered parchment or waxed paper. Add yogurt, nutmeg, and whisk. Add the pumpkin and stir well to combine. Spoon into ramekins. Put the paper circle, buttered side down, loosely on top. Heat 2 tsp olive oil in nonstick skillet over medium-low heat and add shallots. Sauté for 20 minutes, until starting to brown. Add ham and continue to sauté until nicely browned, about 10 minutes longer. Remove timbales from oven and carefully remove ramekins from hot water. Sprinkle with a bit of Paprika. Garnish with Caramelized Shallots and Prosciutto.